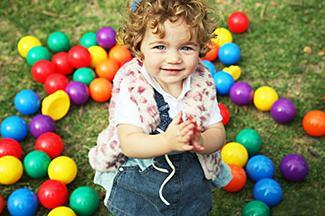 During the toddler years, your child is constantly learning new skills and meeting new milestones. As a parent, it is your job to help maximize your child's development by providing him with activities focused on learning and development. Toddlers learn best through play, so every opportunity for fun is also an opportunity for learning. Kick, kick, kick your feet. Kick them all day long. Kick them up, kick them down, while we sing this song. Wave, wave, wave your arms. Wave them all day long. Wave them high, wave them low, while you sing along. Shake, shake, shake your head. Shake it all day long. Shake it right, shake it left, while we sing this song. Jump, jump, jump up high. Jump all day long. Jump to the front, jump to the back, while you sing along. To walk like an elephant bend over slightly, put one arm out in front of your head, slightly hanging down and swing the arm as you walk. To walk like a giraffe, stand on your tip toes and stretch your neck up as you walk. To waddle like a penguin, hold your arms at your sides, and rock back and forth. Barely move your feet to go forward. To slither like a snake, get down on the floor and try to move without using your arms or legs. To fly like a bird, put your hands on your arm pits, and flap them like wings as you move. To soar like an eagle, spread your arms and alternate learning to the left and the right as you move. To jump like a kangaroo, bring your hands together on your chest with your elbows sticking out to the sides and jump. To hop like a frog, squat down, and jump forward. To prowl like a lion, get down on all fours and slowly crawl forward, low to the ground, then jump forward to pounce. Having your child work through an obstacle course can help her develop thinking skills as well as those gross motor skills. Place three or four hula hoops in a vertical straight line, leaving a small amount of space between each one for your child to step over as she goes from hoop to hoop. 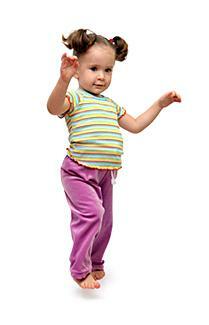 Lay a jump rope or two horizontally for your child to jump over. Set a large box with both ends open on its side to make a tunnel. Lay down a ladder and have your child step over the rungs. Fill a plastic pool with balls, sand or paper to trudge through. End the obtacle course with a bike to ride. Demonstrate how to go through the obstacle course, so your child can see what to do. Can You Push and Pull It? Help your child learn to push and pull while also learning about weight with this activity. Fill five or six cardboard boxes with different objects. The things you use should differ in weight. For example, in one box you may place some books and in another box you may have shredded paper or feathers. Punch two holes in one end of the box, and tie on a string handle. Don't let your child see what is in each box, but have him try to push and pull each box from one end of the room or yard to the other. Ask him if it was easy or hard to push and pull, then show him what was inside. Fine motor skills coordinate small muscle movements. Learning activities involving these skills often find children working with their hands and senses to create and explore. Prepare a package of pudding according to its directions. Use different colors of pudding for more fun, or add food coloring to vanilla pudding to get different colors. When the pudding is ready, pour it onto a cookie sheet or a table covered in plastic wrap. Have your child wash her hands. She can then use her fingers to draw different shapes, lines and squiggles in the pudding. Let her lick the pudding off her fingers before washing her hands after she is finished painting. Your child can feel the different textures and describe to you how each object feels. 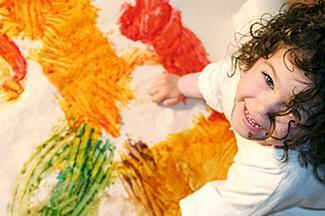 Help little fingers practice grasping objects with this fun art activity. Provide several different colors of dried beans for your child. Have your child place beans over the lines of glue. Create an alphabet book to help your child learn his letters and basic words. Staple or use yarn to tie together 27 pages of construction paper or computer paper. Alternatively, you can add 26 pages to a binder. Label the first page "My Alphabet Book" and every other page with a letter of the alphabet. Encourage your child to look for things that start with a specific letter. You can use magazines, take pictures as you're out, or add mementos. Glue the pictures or items to the appropriate pages. Help your child write the name of each object below the picture. Add pictures to the book, focusing on one letter at a time. Go on a color walk in your neighborhood or the local park. 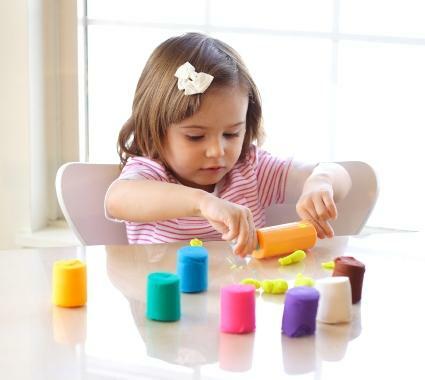 Help your child take a picture of or collect objects that are a specific color. For example, look only for things that are brown. When you get home, review what you found. After you have gone on a few color walks, talk about what colors are harder to find than others. Make a book without words by folding a few pieces of paper in half and gluing a different picture on each page or allowing your child to draw (or scribble) on each page. Every so often, take out the book and let your child tell a story based on the pictures. The story may change each time you read it, and it may not make a lot of sense, but your child will develop speaking skills and the ability to tell a story. If your child does not want to tell a story, make one up for him or start the story and have him finish it. Use basic paper bags to make puppets for a puppet show. You can use the puppets on a more formal stage or as part of a more formal show with an audience or you can talk with your child through the puppets. Take materials such as tissue paper, pom poms, construction paper triangles or strips and yarn and glue it to the top of the paper bag to serve as hair. Add googly eyes, buttons or felt circles for the puppet's eyes. Draw on clothes and other facial features using crayons and markers. Turn breakfast or snack time into a fun sorting game. Take out a 6 or 12-cup muffin tin. Fill a bowl with a cereal that has different colored pieces, pieces from different cereals or a trail mix or other snack mix. Have your child sort the cereal pieces by color or shape, placing each color or shape in a different muffin tin cup. Fill a large bin or pool with water and play a game of sink or float. Have your child place objects such as rubber ducks, toy boats, rocks, tree bark, cotton balls, bottle caps and paper clips into the water to see whether they sink or float. Before you know it, nearly every item in your house may have gone through the sink or float test and your child will learn a little about science in the process. Before going to the park, the zoo or the grocery store, create a scavenger hunt for your child to complete. 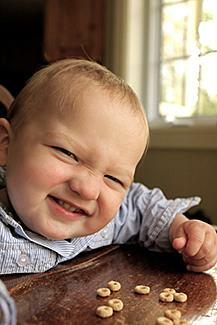 Since generally toddlers cannot read, the scavenger hunt should be comprised of pictures. You can create a simple Word file with clip art pictures to represent the items you want your child to find or draw or cut/paste your own pictures on a piece of white paper. Stick to 5 or 6 items to make the scavenger hunt challenging and still keep your child's attention. The key to all toddler learning activities is that you are engaged with your child during the activity. Most toddlers want attention from parents and loved ones more than anything and if they see you enjoying an activity, they are more likely to want to do it or enjoy it too. As you go through the activity, talk to your toddler about it, asking questions such as "why do you think this is happening?" or "how does that make you feel?" If your child doesn't seem interested in an activity or is frustrated by it, don't force it Take a break and try something else. To minimize a lack of attention, keep in mind that your toddler's attention span is short and you'll typically need to switch to a new activity every five to ten minutes.